The snow is back UBC — one week before reading week, and just in time for you to start seriously hoping your midterm gets canceled. But more importantly, the snow also means The Calendar is back with Campus-Wide Snowball Fight 3.0. 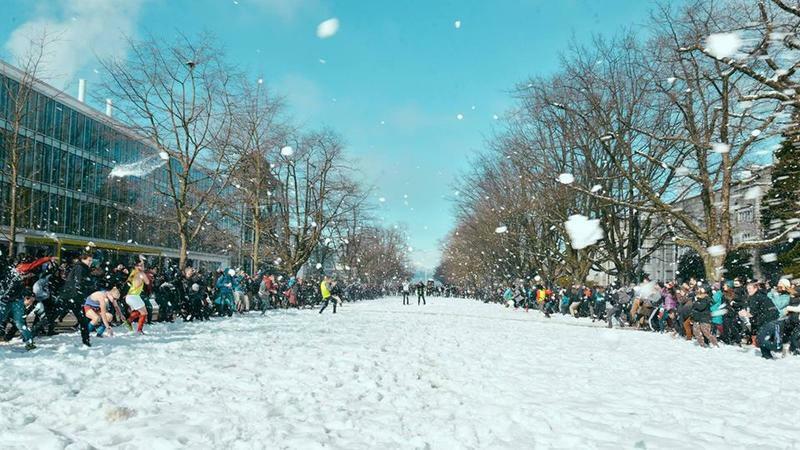 If the rain doesn’t wash the snow away then the fight is on February 13 at 12 p.m. on either sides on Main Mall between the Sauder and Chemistry buildings. The timeline is all planned out so make sure you stick to it. At 11:45 a.m. gather on either sides of main mall along Chemistry or Sauder. You can start piling up your ammo but hold your fire until 11:59 a.m. At exactly noon, it’s time to “SEND IT” per the Calendar’s instructions. If you’re still not sure what to expect, you can check out this video from five years ago. This event is perfect for letting out some mid-semester angst. Throw a snowball at your roommate for “forgetting” to throw out their rotting food for the past week. Or let your TA know how you really feel about their feedback on your assignment. All in the good spirit of getting into the seasonal activities, of course.